Call Us : 0 9830650532. MANUFACTURE AND SUPPLIER OF INDUSTRIAL SPRAY NOZZLES AT A VERY COMPETITIVE RATES WITH A CLASS RAW MATERIAL ON BULK QUANTITY ORDERS. We are a renowned Manufacturer and Supplier of Spiral Spray Nozzle, which is well-acclaimed for its unique design and high performance in the domestic market. 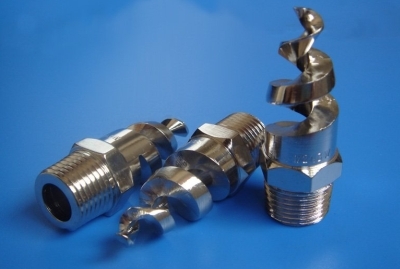 This type Spiral Spray Nozzles that are available for spray angle 25 to 180 degree. Moreover, its free Passage design minimizes clogging being a one piece construction. 2.Spray Angle: available 25 degree to 180 degree at 3 bar water pressure. 3.Flow Rate:Standard Flow or OEM Flow Available at @ bar. 4.Spray Nozzle Pattern: Flat Fan(Standard Spray or Wide Angle and Narrow Angle), Solid Cone/Full Cone, Hollow Cone, Spiral Cone (Full Cone and Hollow Cone), Fog Misting, Plastic Nozzles. 5.Nozzles material: Stainless Steel (303SS,304SS,316SS), Brass, Brass Plated Nickel, Plastics(PVC, Teflon,PP). 6.Flow Rate:Standard Flow/Capacity or OEM available as per customers' requirements. 7.Application: High Pressure Washing/Cleaning, Humidifying, Air Cooling, Pollution Control, Steel Industry, Mining Industry,Automobile, Food Processing,Paper Making, Pharmaceutical, Dust Remove, Drying, Coating etc. Contact Person : Mr. A. R. Roy. Address : 1/B Kali Bari Lane, 1st Floor. Jadavpur. Kolkata - 700 032. West Bengal. All Email Enquiry will be replied within 3 hrs.